A friend and master beekeeper from Connecticut, Bill Hesbach, wrote the following account about his misadventures with an oxalic acid vaporizer and a face mask. First posted on BEE-L, the story is a cautionary tale of the hazards of working with oxalic acid, and a reminder that when things begin going south, they sometimes just keep going. Thank you, Bill, for allowing me to re-post your story. This accident was operator error but I wanted folks to know what occurred because I think it can happen to anyone using this device. I’ve been using a ProVap 110 successfully for two years without a problem until yesterday. I use it per the manufacturer’s instructions with one exception. The exception is that, with my equipment, I couldn’t drill the holes in the bottom board rim so I drilled them in the [brood] box below the rear hand hold. It worked just fine until a frame inside one box managed to get aligned with the hole. That only leaves about 3/8-inch between the frame and the inside surface of the box where the hole is drilled. When I inserted the discharge tube, which is about 1½ inches long, it must have butted up against the frame’s end bar leaving no room for the gases to exit. As a result, when I turned the ProVap over to sublimate the oxalic acid, the white Teflon lid that holds the oxalic acid exploded off the device spewing extremely hot gas and liquid OA everywhere. I had a full-face respirator which saved my face from severe burns (see the photo) but I learned something else about the respirator. This photo shows how a face mask saved Bill from the splatter of burning-hot liquid from an oxalic acid vaporizer. © Bill Hesbach. Well, in this incident, the air around my respirator was filled with gases and just like the safety experts said, some began to infiltrate around those eyeglass arms which prompted me to drop everything and run to safety where I could remove the respirator. Since I never had an incident before I didn’t realize that the way I was wearing the face mask would allow that to happen. I’ve since taken two corrective actions. First, I installed a spacer on the discharge tube of the ProVap so it can’t extend beyond the 3/4 thickness of the box, therefore, avoiding any frame obstructions inside when they happen to align with the hole. Second, since my eyeglass arms are just thin wire, I’m now tightening the pull straps on the mask enough so that when I inhale I can feel a slight compression of the mask which indicates I have the needed vapor lock. I have worked with a respirator for 30 years. A proper fit requires a positive check exhale with hand over the cartridge(s) to feel respirator push away from the face followed by a negative check which is inhaling with hand over the exhalation valve and hold for 5-10 seconds to verify seal. Always do the positive first and the negative second to seat the seal. Wearing the glasses with thin arms is still incorrect. If correcting for reading and you don’t have respirator glasses then you can fashion/fab a pair from readers with the arms removed. Remove the arms from the readers and fab a way with a suction cup (like the kind you paste trinkets to windows) to stick the readers to the inside of the lens not interfering with the seal. Of course this only works for the close work but you could do the same with a pair of old prescription lenses. These of course are not approved respirator glasses but they are better than interfering with the seal and will serve the purpose,. Yea, he was lucky to have on a full face vs a half face, I can only imagine the burns to the face based on the picture posted. Thanks for sharing. I started using the Mighty Mite Killer this year and love it so far. No chemicals or fumes. This man’s experience shows how important it is to get things right when using any acid – gloves, safety glasses, etc. Acids are dangerous requiring a large dose of care. The problem here is the method by which the oxalic acid was delivered – outside the hive box. I never saw a ProVac before this posting and having seen what happened have to think that for most small beekeepers it is not the unit for them. OA can be quickly and easily delivered safely using any one of the small vapourizers that place the dry crystals inside the hive where the crystals are heated and vapourized. There is little risk to the beekeeper outside of moving away and upwind of gases that escape from the hive. This last for just a few minutes then another 10 or so to work inside the hive. If any detection of vapour you simply move further away. There is never a reason to get close while the unit is working other than to turn off the power which can be done in seconds. Many hives have sufficiently wide entrance openings where this type of vapourizer can be inserted. For those of us who have permanently reduced entrance openings (think yellowjackets) you need to devise some way to get the unit inside the hive. 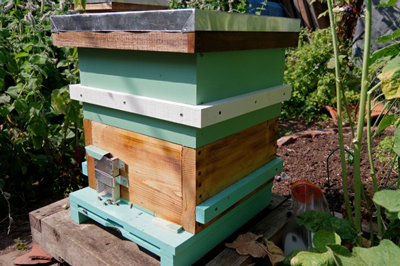 I do it by having a hive bottom that allows the unit to slide in below a screened hive bottom. I cut a dado in the underside of the bottom screen to provide clearance for the unit while also removing a mite drop board that normally fills the slot. This is super safe. No acids other than dry crystals followed by vapour while I watch a safe distance away. Rusty, sending a photo showing this base and slot for the OA unit. The base of this hive consists of two parts. 1. A lower stand and platform and 2. a screened bottom board. To get sufficient clearance for the OA unit I had to notch-out the underside of the screened bottom board. I thought I had sufficient clearance when I built the base and screened bottom board but a high spot on the vapourizing tool prevented the tool from going inside. The dado is a retro-fit. Doing it again I would simply make the primary opening deeper. This set up works very well. It keeps the vapourizing unit well below any brood comb that might otherwise extend close to the screened bottom board where it is possible for bees to come in contact with the heating element. This may have been asked and answered before but can you use an oxalic acid vaporizer under a bottom screened board that goes directly to the brood box, on a non windy day. instead of shoving it in the entrance or will too much get lost? I don’t want to burn bees. I have used the oxalic acid vaporizers under the bottom screen board through most of the summer 2017/2018, and found that much of the vapor turned back to oxalic acid crystals on the bottom board screen. The mite count was still high so have gone back to excepted practice (on top of the boom board under broad) and mite count back to zero on the sticky board. That depends on the whether the design of your screened bottom board allows you to seal it somehow below where your vaporizer is placed and around where you put it in. You can’t have it wide open under the screen. If it is you’ll get a big cloud of oxalic acid vapor outside the hive and an unknown amount inside, so you won’t know how well it will work on the mites. My screened bottom board allows me to slide a piece of sheet metal in from the back, leaving a space about 3/4″ between it and the screen above. Then I slide the vaporizer in from the back on top of the sheet metal and seal up the gap in the back temporarily with a strip of foam rubber. Of course, I also close up the entrance. One thing about vaporizing from below the screen is that the screen needs to be clear of debris above the vaporizer. I usually reach in from the front entrance with a stick and scrape it off to be sure. By mid-winter there can be a good layer of dead bees and debris there that would impede the upward flow of the vapor if not removed. Good thought about not wanting to fry bees as you vaporize. Doing it from below the screen also greatly reduces the chance of starting a fire in the hive. Special thanks to all those people with the confidence to share their embarrassing mistakes with the rest of the internet for our education and protection. For Heather, Yes. If using a heated pan vapouriser, getting the vapouriser to stay level is the trick, so I put a second bottom screened board underneath. This means that there is no danger of burning bees (or the hive if a poly-hive) and you can keep the small entrance to keep out mice and wasps. Check that the bees haven’t made comb under the screen which they sometimes do. I am transitioning my apiary to Varroa Sensitive Hygienic bees. It requires a bit of research to find queens that have been properly raised and engineered and are truly a hygienic strain. The breeders I buy my queens from never have to treat their bees for varroa. That’s great, but don’t forget to monitor your bees for mites on a regular basis. Your colonies will have different mite pressures than the breeder had. You live in a different area (I assume) so the density of colonies near yours will be different also. The best way to know how your colonies are doing is to check them regularly by counting mites and recording the numbers. Thank you all so much for your responses. I love this site and how much I learn here. VSH does NOT mean ‘no mites’. These bees still get mites, they still get virus. So ?????????? “Never” is one of them words I “never” say ! Good ole Murphy ! That kind of ‘thinking’ gets one in trouble when they go out and find out their hive is toast. There are many queen breeders selling their wares, be wary ! I guess I don’t understand your question. Beekeepers all over the world now vaporize oxalic acid.